Off-roaders, diesel truck owners, and those planning to own their vehicles for long periods of time know the advantages of cotton reusable air filters. 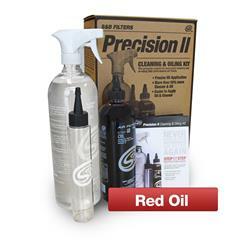 S&B Filters Precision II cleaning and oiling kits are ideal for recharging filters in your vehicles. Each kit has 63 percent more cleaner than before, a reengineered oil applicator for better coverage, and a finger-friendly trigger applicator for the cleaner. S&B Filters Precision II cleaning and oiling kits provide excellent wet-weather and dust protection. Air Filter Cleaner Volume: 32 oz. Air Filter Oil Volume: 16 oz.